According to the Population and Housing Census in 2011, the homeless population in Romania consists of 162.375 people.The phenomenon of homelessness is rising due to the poverty and increasing housing prices. It is estimated that there are over 5,000 homeless people in Bucharest. Among the adults, it is estimated that 65% are male and 35% are female. Some of these people became homeless because the buildings of the former “nationalized houses” have been claimed and they were evicted from the houses for which they paid rent. EMAS (Salvation Army’s Mobile Team) is a social and health service dedicated to homeless people. EMAS works 3 nights a week, between 18’00 and 00’30, providing information, health care, social and counselling services, and facilitates access to the social and health services provided by the government or NGOs. Preventing the deaths of the homeless who take shelter on the streets, providing social and health care services to the homeless who are not medically and socially insured. Providing food and emergency health care services to the beneficiaries. Increasing life expectancy and the quality of life of homeless people, providing opportunities for social inclusion for the target group, including housing, finding a workplace; other social or group activities. Homeless people or families who live on “the streets” (including children and Roma families), people who were evicted from “nationalized homes”. People who do not own a place, don’t have access to social or decent housing. Vulnerable people who are at risk of being evicted from their own homes. Adults (over 18) or families with children in vital and social emergencies who live on the streets. People who have lost their home and don’t have financial or material resources, or a functional place to stay (no power, no water, broken roof etc.). The indirect beneficiaries of the program are families who come from PAFA, the civil society and community in Bucharest, professionals and volunteers working in social services in Bucharest. If you feel that, come join us in the Salvation Army volunteer team! ReDesign is a manucfacturing creation workshop, a Salvation Army Association social economy enterprise. The ReDesign project offers the possibility of professional training at the workplace for vulnerable youth and parents. ReDesign is a transition space that helps people in need move from social exclusion to employment and social inclusion. ReDesign benefits from 2 manufacturing workshops in Ploiesti and Iasi, where wallets and leather goods are made. June 2016 – April 2018. The Salvation Army Romania & Fretex Norway/The Salvation Army Norway, funded by Norway Grants. To provide a workplace and a transition period to the associations’ beneficiaries, them being capable of finding a job in a social economy structure (S.E.S.) or in a company. To provide help to beneficiaries by training them for the conditions, standards and requirements of a workplace. Poor people, persons affected by exclusion from the labor market. Roma people, motivated to be employed or to be trained in order to have access to the labor market. Parents of children with school drop-out risk or at the risk of being abandoned by their family. Particular emphasis is placed on people affected by social exclusion on the labor market. In this project about 35 beneficiaries will be fed once a day, 3 times per week throughout the project. The food will be prepared in the kitchen of Craiova corps. With the help of the corps, the food will be taken to beneficiaries in the station area (where they use to gather) and will be given to them. All project activities will be coordinated by an employee who will be helped daily by volunteers in the corps. Also this project helps the Salvation Army to be seen in action. May people stop and ask why we are and why we do this work. This project is a great ability for the Salvation Army to serve God. Aim: Create a community that foster new partnership, to deliver a high quality feeding program that gives hope, compassion and security for the homeless. To fulfil the hunger needs of the homeless people. To have people leave the centre feeling good about themselves by reinforcing a positive psychological attitude. The provide and environment where people can share with each other socially. To ensure confidence and a greater sense of independence, self-respect and community inclusiveness. To advocate with the local government on the needs of the disadvantaged in the community. To enable people coming into the centre to explore spiritual solution to life’s problems. This project is designed to enable homeless and disadvantaged people access to laundry facilities, shower facilities and provide education, social and spiritual activities that will enable them to integrate into the community and have their physical, emotional and spiritual needs addressed. Aim: This project seek to raise the quality of life of the poorest, most socially disadvantaged and spiritually isolated people in the Iasi community. The project does this by offering a holistic ministry for people in the community. This project is not just about laundry but seeks to give people a life changing experience and a belonging christian community where they feel valued and loved. To have people coming to the centre leave with clean clothes and body. Over 3,3 million volunteers of all ages have given their time, skills and resources to support The Salvation Army’s activity in all the world. Although at a European level the population in Romania is not very active in the volunteering field, compared to other European Union countries, our organization, through this program, wants to promote the Salvation Army International experience that unfolds programs in over 130 countries with the help of volunteers. We believe that volunteering itself is a type of life-long learning for adults through which participants, when in action, develop their skills and competences needed in their personal and spiritual growth. The Volunteering Resources Centre in Bucharest is a program meant for volunteers and the community of Bucharest in order to create personal development opportunities for the volunteers and sustainable development for the community. Through this program we combine the personal development programs for volunteers with the action taken in the name of the people and the communities in which we work. We want, through this project, to increase the number of the involved volunteers, to increase the involvement rate of the citizens in the community, to innovate the field of volunteering and to increase the visibility of volunteering among the members of the communities in which we work. Most of the volunteers work with enthusiasm on short-term. One of the objectives of the Volunteering Resources Centre is to identify the motivation and aspirations of the volunteers, that could make them to take action constantly, with enthusiasm, and on the long term in educational, social, community or humanitarian projects and programs of the association. The project started on December 5, 2018 and it is still running. The project’s promoter is The Salvation Army in Romania Association. To increase the number of involved volunteers, to increase the involvement rate of the citizens in the community, to innovate the volunteering field and to increase the visibility of volunteering among the members of the communities in which we work. Setting up a library and a Volunteering Resources Centre in Bucharest. Volunteers, pupils, students, employees, retired people, associations and foundations that unfold activities in Bucharest during summer, the community in Costinesti. a certified consulting firm provides PSI and SSM services for the volunteers. SALVATtex is Salvation Army Association social economy enterprise. SALVATtex is a platform that provides training at the workplace or training for employment. SALVATtex is a transition space that helps people in need move from social exclusion to employment and social inclusion. SALVATtex benefits from a sorting process in Ploiesti of the “occasional” textile products that it distributes to the SALVATtex store network that reached its 6th store. Revenue from store sales returns into the social projects ran by The Salvation Army. Through SALVATtex, it is also offered the possibility of professional training at the workplace for disadvantaged youth and parents. January 2015 – March 2018. 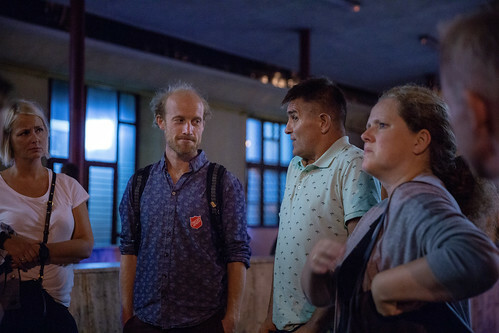 The Salvation Army in Romania Association, together with The Salvation Army in Norway, Fretex Norway, with Norway Grants funds.